My daughter's been riding horses a full four years now. She's been showing in rated shows for three. At the end of last year, she fell during a show as she was trying to move up to her first jumping class. It was a rough few months as her confidence was shaken. This spring she was still not confident enough to show in a jumping class. Funny thing is, she jumps during every lesson she has. She's good at it. But she was afraid to do it in a show after her fall. 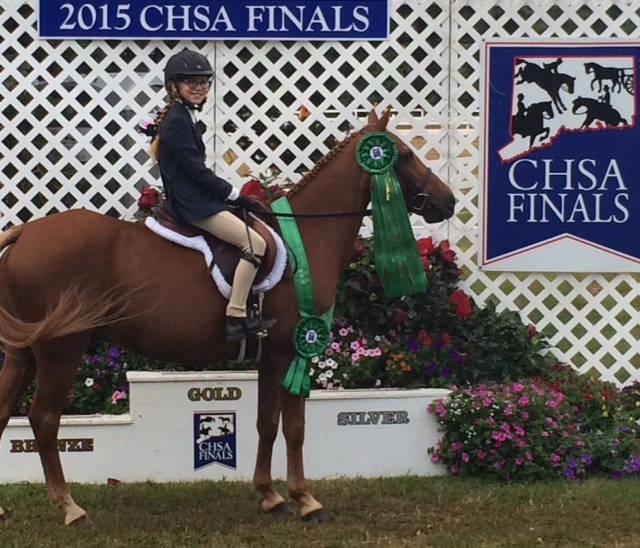 After some encouragement from the older girls at her barn, she showed in a jumping class this April. Every time she did it, she was super nervous, but she dug deep, faced her fears, and continued to show in what's called Short Stirrup (cantering over cross-rails on a course) all spring and summer. She racked up enough points to qualify for the finals, which happened this weekend. She took 6th place out of the 12 riders. I learn so much from her. I couldn't be more proud of how she handled herself this year. She matured so much. She got to be a much stronger rider. She is proud of herself, and I know this season taught her so many good things, that she'll take with her into the rest of her life. She got this great horse fabric, Wild Horses, by Exclusively Quilters at our local quilt shop's annual clearance this winter. 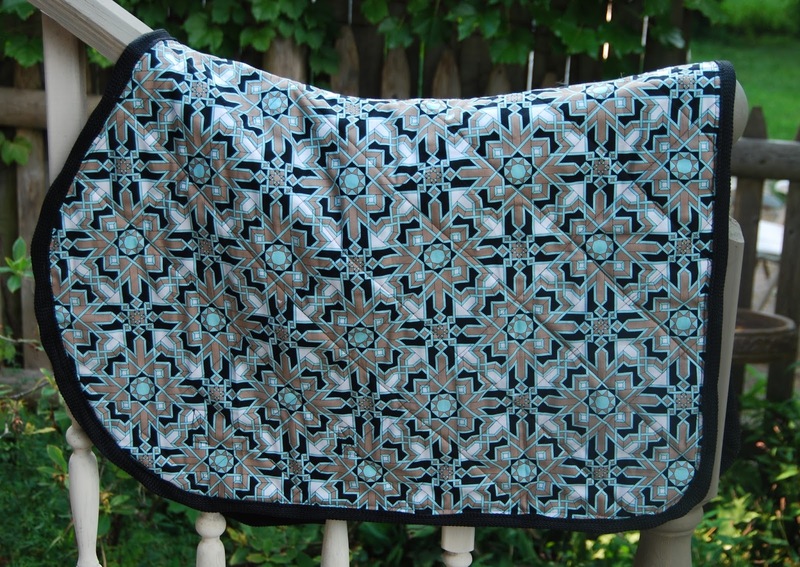 She's been begging me to make her a new saddle pad for her ever since. After her performance this weekend, how could I not??? I've made this pattern once before, it's by Suitability #7158. The hardest part was finding a good binding to use for the edges. They take a lot of wear and washing. 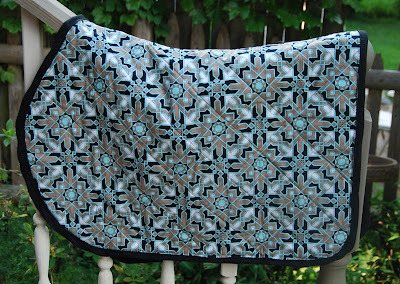 Here's her finished saddle pad. It's regular quilter's cotton, so it won't last more than one season with the abuse it'll take. But it makes my daughter feel special to have something made just for her. It's super easy to put together, with basic diamond quilting and normal cotton batting in between. I found a 1 1/2" woven black binding on Etsy. It looks great, but isn't super strong and it actually wore out on the first one before the fabric did. 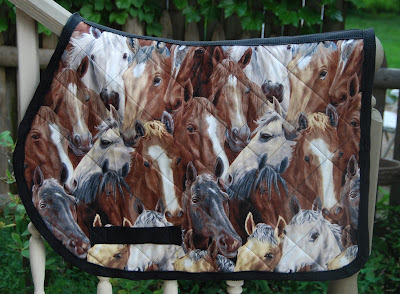 The back I used because it's called Horse Blanket (seriously, what ELSE would I use?) and the colors looked great with the front to me. 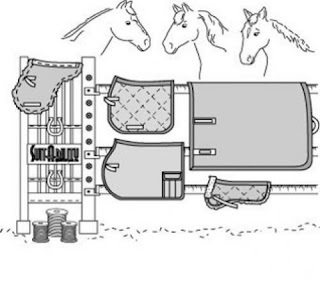 If you've ever made one of these, I'd love to hear about it, and I'd love to know where you got your binding.